Good Company Players’ Junior Company performs a 15 to 20-minute Pre-Show before most GCP productions at Roger Rocka’s Dinner Theater in Fresno’s Tower District. The Pre-Show features this gifted company of young performers in a wide variety of musical genres in their own mini-revue. 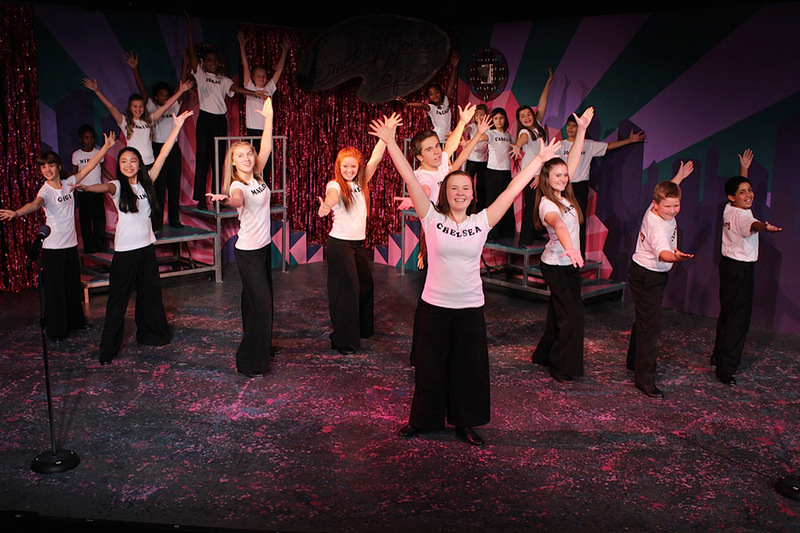 The Junior Company usually numbers 18-20 young people, aged 8 to 16 years. Good Company Players looks for a balance of ages, sizes, genders and ethnicities, as well as talent. Formal voice and dance training is not a pre-requisite for acceptance into the Junior Company. Other attributes sought in Junior Company members: potential, motivation, maturity, courtesy and commitment. These attitudes must also apply to school work since Company members must maintain an acceptable grade average of 2.5 to perform. We expect Junior Company members and their families to take the performance commitment as seriously as we do; only minimal rehearsal or performance conflicts are accepted. The Junior Company rehearses on Saturdays during the day. The performance commitment is substantial: the Pre-Show goes on four to six times a week, Thursdays through Sundays with two shows on most Sundays and some Wednesday performances. Each Junior Company normally includes two Pre-Shows at a time; the total time commitment can run from 14 to 19 weeks. Since the first Junior Company was formed in 1978, “alums” of this group have played key roles in GCP shows. many have gone on to professional training and careers for which the Junior Company was an acknowledged foundation. Auditions for the Junior Company are held 3 times a year and any interested youngster is welcome. Current members of the Junior Company must re-audition to retain their place in the Company. The audition consists of singing a memorized song, learning a dance combination, executing a simple harmony exercise and answering a question or two. Auditionees must bring in sheet music in the key in which they plan to sing. An accompanist is provided. We do not accept a capella auditions nor recorded accompaniments. The song should be sung simply, directly to the listeners without any choreographed movements. We do allow auditionees to provide their own pianist. For the dance portion of the audition, no preparation is required. A choreographer will teach some steps and evaluate the young people’s ability to learn and perform them. Not everyone may be equally skilled but it is important to remember that we also consider attitude, concentration and listening skills to be important factors when we choose our companies. This includes courtesy while others are auditioning and the ability to hold still and stay focused while auditioning yourself. Performing with the Junior Company requires concentration, teamwork and respect for others and the process. Good Company Players is an amateur theater company which produces plays in both The 2nd Space Theatre, and at Roger Rocka’s Dinner Theater. Any member of the community is welcome to audition for all roles in all shows. Occasionally some casting decisions have already been made before auditions but these instances are rare. Performers and crew members are volunteers seeking training and/or a recreational outlet. GCP makes an effort to defray the expenses of performers and crews with a nominal expense reimbursement issued at the end of the show’s run but no volunteers are paid to participate.